What's the Oldest Book You Own? When it comes to collecting, book lovers have assorted passions. Some people love collecting first editions. I dabbled in this for a little while myself and spent a couple years collecting Stephen King first editions when I came across them. I have a nice little collection. Other people love collecting autographs This never did much for me, but I’ve got a couple I’m proud of (among them; Timothy Zahn’s Angelmass, and a personalized first edition of Heart-Shaped Box by Joe Hill that I love). My passion, however, is old books. I love the sense of history ingrained into them just by their continued existence. I find it immensely exciting. To illustrate my point, I was just looking on eBay and found a copy of Nicholas Nickleby by Charles Dickens which was published in 1865. EIGHTEEN SIXTY-FIVE! To put that into context for you…when that book came into existence, Charles Dickens was still alive, five years from death. In 1865, the Civil War ended and Abraham Lincoln was shot. 1865 was twenty-three years before the Jack the Ripper hysteria. Maybe you’re looking at that list and thinking “so what?” but it gives me chills just to think about it. Taking a mundane object and placing it in its historical context is incredibly exciting for me. It gives me the same awed feeling you might get if you went to a museum and saw something thousands of years old. That feeling, of standing in the presence of age and history, is what I get out of very old books, on a smaller scale. Seen here propped open by my muse. This is The Horla And Other Stories by Guy de Maupassant. It has a funny story behind my owning it. As a thank-you for whatever work I had done, my friend the boss sent me a box out of nowhere, and in it were two books by Guy de Maupassant. They’re old editions, one from 1911 and one from 1937. It was extremely random of him. I like Guy de Maupassant’s short stories very much. I think he’s an evocative and powerful writer, very much like Edgar Allan Poe but without the macabre elements. But I had never ever mentioned him. He’s just not a writer I ever bring up, that’s all. Still, I adored the two books. I flipped through them often, I am careful when we move with them, and they sit enshrined and safe atop my main bookshelves, away from small children and clumsy writers with tea. Years went by, as they do. Then, out of nowhere, a very good friend of mine out of the blue asked for my address so she could send me something she had found, which she thought I’d like. 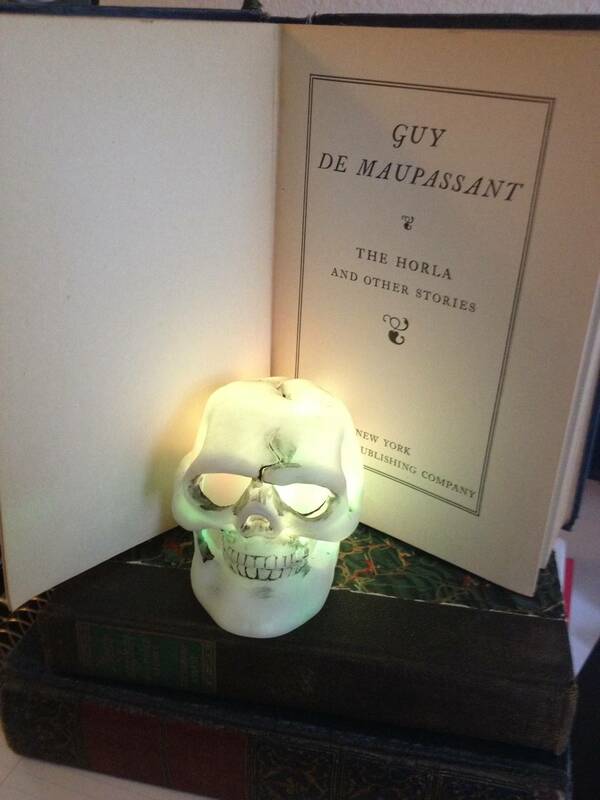 The box arrived and I pulled out…The Horla And Other Stories by Maupassant, from 1903. In the in-between years, I had still not mentioned Maupassant. He’s just never a writer that comes up in conversation. I also love the prose-imagery of Jack London, but this is the first time I’ve ever mentioned that in print. It’s the same thing. So what I love is that despite never mentioning him, two separate people (who do not know each other) came across very old Guy de Maupassant books and thought “Peter should have these.” Make of this what you will, but it makes me very happy. Everyone should inspire an inexplicable author-reaction in their friends, I think. And that is the oldest book I own. There’ll be more in the coming years, rest assured. If I have a book hobby, other than reading the hell out of them, then this is it.